A very eventful year for J & S Transport has come to a close with the hope 2013 brings improvement to our economy allowing stronger growth and prosperity for us all. We must strive for 2013 to be accident and injury free. 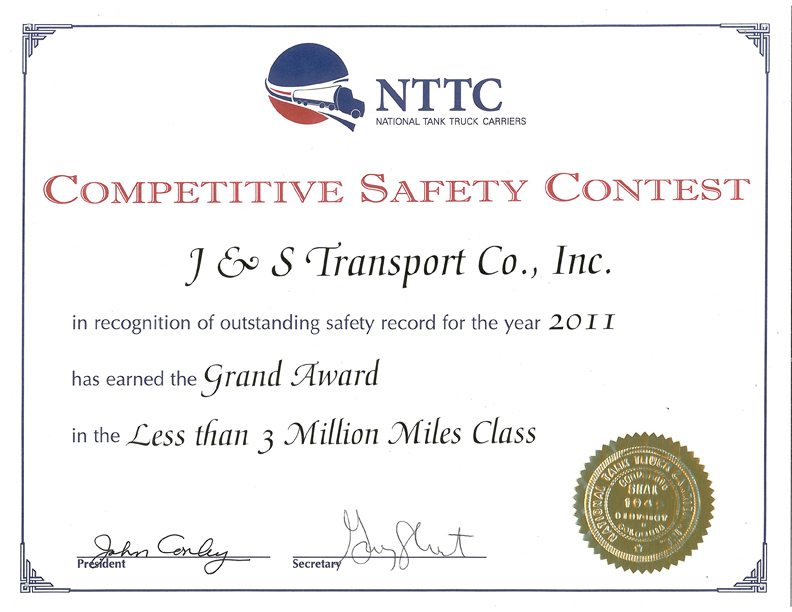 This is the resolution J & S Transport shall make for the New Year. If we control the cost of these involvements, our insurance ratings will improve allowing additional operating revenue. Please join us in welcoming our 2 new drivers; Jim Braid and Mike Atwood. Jim Braid is well known in our industry and Mike Atwood brings extensive experience and knowledge as a delivery driver. Please introduce yourselves to Jim and Mike, welcoming them to the team. Have you noticed the construction going on around the property? Since Artic Oil sustained the fire to their facility, they opted to purchase the property and building once owned by Rossi Memorials. They will operate Artic Oil and Ferrari Landscape from that new location. John and Sharon Hamel have agreed to lease the old location, renovate the damaged building, moving the corporate office into the new and improved facility. This will increase the yard area for our equipment with future expansion possibilities. Mark your calendars with the date of our Annual Meeting. We will again be holding our meeting at the Boston Marriott Peabody, MA on March 2, 2013. We will be providing more information as we finalize the details. 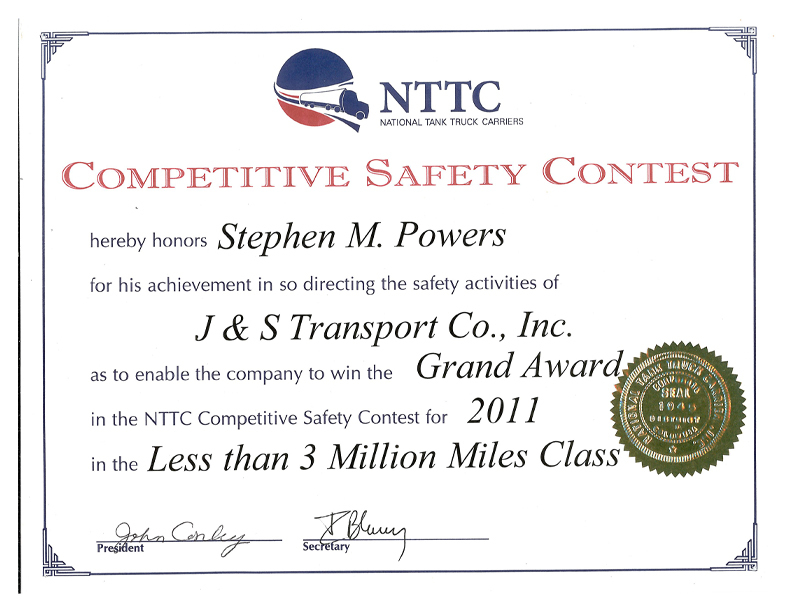 J & S Transport took part in the Danvers, MA Truck Show this past fall. Don Wood entered our unit into the show ensuring the unit was detailed bumper to bumper. Our unit proved to be a big hit with Donnie being a tour guide, explaining the role of a petroleum tanker while letting kids sit in the driver’s seat and blow the air horn. In this picture, Don is with his beautiful wife Lori and their children, little Donald and Benjamin who appear to have had enough of that air horn! Employees will be receiving more detailed information as the compliance date nears. I am quite sure you are aware that the Commonwealth of Massachusetts has legalized Medical Marijuana with Colorado and Washington legalizing recreational usage. Before any CDL holder thinks they can torch a blunt while mellowing on the “Jimi Hendrix Experience”; better reconsider this action. The Department of Transportation makes it perfectly clear that State guidelines on Marijuana usage will have no bearing on the FMCSA’s Drug Testing Program. The DOT’s Drug and Alcohol Testing Regulation – 49CFR Part 40.151(e) does not authorize any marijuana usage under state law to be a valid medical explanation for a positive drug test result. When faced with a life threatening emergency, we all know to call 911. However, the National Safety Council explains that some people might not know how to make an effective 911 call and how to avoid issues that can arise when calling from a cell phone. In an emergency situation, a caller might experience a wide range of emotions which could interfere with their ability to communicate clearly. Knowing ahead of time what information the 911 Dispatcher will ask for preventing extended response times. Making an effective 911 call requires knowledge about how your cell phone will work in certain locations. Cell phone users need to realize that cell phone calls may not be traced. Tracing a cell phone relies on the triangulation of wireless signals. Many “smart phones” have GPS apps that assist in the location of the device but users need to understand the limitations of the cell phone they have. Case in point, if a 911 emergency call is made with a cell phone inside a building, locating the caller’s wireless signal becomes difficult. Emergency experts advise cell phone callers to quickly advise 911 Dispatchers their exact address, including floor and apartment numbers. The National Safety Council advises to only make a 911 call when immediate response is needed for a vehicle accident, fire, serious illness, injury or crime. Stay calm and tell the Dispatcher your name, location, phone number and nature of the emergency. Do not assume the Dispatcher will be able to track your location, and by all means, do not hang up on the Dispatcher. Every call must be taken seriously, so a Dispatcher will redial the number of the caller to ascertain the true nature of the call. Stay on the line and follow directions. Do not end the call until the Dispatcher tells you to hand up. Under no circumstance is the 911 System to be used for non-emergencies. Prevention is the key to combat hypothermia. The selection of appropriate clothing is paramount. Synthetic and wool fabrics are superior to cotton as they provide better insulation when wet or dry. Some synthetic fabrics, such as polypropylene and polyester, are used in clothing designed to wick perspiration away from the body, such as liner socks and moisture–wicking undergarments. If the Saint Bernard comes by with a keg of brandy; shoo him away. Alcohol consumption increases the risk of hypothermia by dilating blood vessels which increase blood flow, making you feel warm while increasing heat loss to vital organs. How about a quick healthy dinner recipe to warm up the family on a cold winter’s evening? How about messy, lip smacking, napkin wasting Sloppy Joes? You may want to use 96% lean ground beef or ground turkey breast.